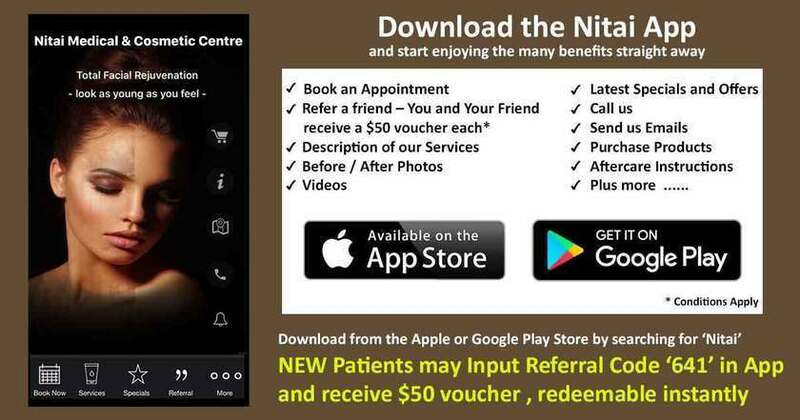 Why Should I Choose Nitai Medical & Cossmetic Centre for Treatment? 1. All Laser procedures are supervised by a Specialised Cosmetic Doctor. 2. Nitai Medical & Cosmetic Centre is committed to Quality & Safety and Optimal Results at the most economical cost. 3. Laser Hair reduction needs to be individualized depending on the area treated, the skin type of the patient and any underlying medical conditions. 4. A specific laser is used with a treatment plan to maximize results. 5. Some medications may not be used during Laser treatments. This will also be checked by the doctor. 6. Some medications may be prescribed by the doctor to further reduce hair growth in some circumstances. What Is the Difference Between IPL & Laser? IPL systems emit a broad range of wavelengths and are simple and very economical to use but cannot be used on all skin types. Laser systems emit only a specific wavelength and are much more powerful. They are more effective to use as they are more selective to hair follicles, so results are better with laser. They can be used in darker skin types very effectively, safely with a know risk profile and comfortably. We also have a specific laser that is useful for treatment of fine vellous pigmented hair . IPL has no effect on these. Our laser has an inbuilt cooling head which together with a cooling gel is used during the procedure to minimise pain. The comfort of the client is of utmost concern during the procedure and everything possible is done to maintain a pain-free treatment. Why Are Lasers Used in Hair Reduction? We are able to treat any area of the body safely (with a well understood risk profile). It results in a smooth hair free skin. It reduces the inconvenience and pain of waxing therapy and plucking. Research shows over the lifetime, laser therapy actually works out cheaper! What if my excessive hair is due to a medical condition? 1. Polycystic Ovarian syndrome-In this condition women tend to have acne as well as excessive hair. Laser is very effective for hair reduction but will also treat the acne. 2. Pilonidal sinuses-Laser hair removal is very effective. 3. In grown hairs-Laser hair removal is very effective. All laser treatments are supervised by Dr. Singh to minimise any risk to our clients. Laser (not IPL) is used to reduce and eliminate any risk of burns, hypo & hyperpigmentation. Patients who are pregnant are not treated. All laser treatments are supervised by Dr. Singh to minimise any risk to our clients. Laser (not IPL) is used to reduce and eliminate any risk of burns, hypo & hyperpigmentation. Patients who are pregnant are not treated.We have very advanced and sophisticated lasers available so all skin types can be treated. Males and females can be treated. Blond or grey hair cannot be treated due to loss of pigment. Cost of the treatment will be discussed during the initial consultation. Cost of treatments can range between $50-$330, depending on the area being treated. Significant discounts are also provided in treatment packages. Does Laser Hair Reduction Therapy Cause Cancer? No. All currently approved medical lasers used in our clinic are incapable of ionising tissues and have none of the risks associated with the radiation used in cancer therapy. Does Long Does it Last? Laser Hair reduction is permanent. To contact us please complete call (03) 9300 1244 or send us an email via our contact form. Your email will be forwarded to the appropriate staff member to respond. The IPL or “Intense Pulsed Light” or IPL works by emitting a short burst of light that is selectively absorbed by the melanin in the skin and hair. The resultant heat that is created within these structures prevents hair regrowth of the hair follicle and stimulates regeneration of the skin. Due to the risks that IPL can pose for certain skin types, you should consult our doctor to confirm whether the IPL is suitable for you. At Nitai Medical & Cosmetic Centre to mitigate the risks posed by an IPL treatment, we prefer to use a Medical Grade laser machine instead of an IPL.